2019 Minnesota River flooding has caused major backup into Eagle Creek. As of April 12, the lower section of stream remains high. The frontage road near Hwy 13 is open. Expect fishing conditions to be poor to iffy until water recedes to more-normal levels. Stream conditions are closer-to-normal for sections upstream of the 126th Street crossing. Fish species from the Minnesota River and Rice Lake might be part/all of your Eagle Creek catch. We will post an update-- or remove this alert-- once water levels return to normal. Courthouse Lake (Chaska) is scheduled to received its planned rainbow trout quota for the start of the open-water fishing season May 11. Keep in mind that, unlike for other species' seasons opening that day, the season for trout in lakes begins at one hour before local sunrise. 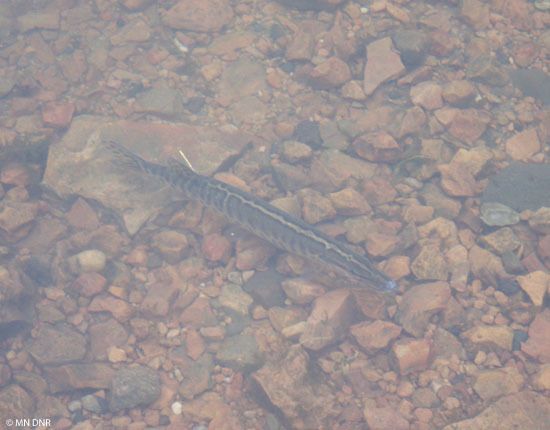 Any trout remaining from previous stockings will also be available, as well as at Quarry Lake (Shakopee) and Little Long Lake (Minnetrista). Christmas Lake was last stocked with trout in 2016, so few, if any, fish remain. Check MN DNR Fishing regulations for details about trout fishing in lakes. See our Trout waters page for more information about local trout-fishing management and opportunities. Our office is in the Blue Lake Business Center on Scott Co. Hwy. 101 (between US Hwy 169 and Valleyfair amusement park). We share space with two other MN DNR disciplines (Parks & Trails, Wildlife) and Conservation Corps Minnesota-Iowa . No license sales or registration/titling services are available, and we have no hatchery or live fish displays for tours. If you'd like to visit us in person, we recommend you contact us beforehand to ensure staff will be here. Because we're a small, field-oriented office, drop-in visitors could find no available help.